Quite possibly the single best feature of the AR-15 is the unprecedented amount of aftermarket parts available. This variety, paired with the inherently lightweight design, means anyone can easily have an extremely lightweight AR-15. This level of rifle modularity has literally never been seen before to this extent in all of firearms history. For those of us living in states without feature bans, this is the golden age of firearms. One of the initial draws of the AR-15 over alternative rifles is how incredibly light it is by default. 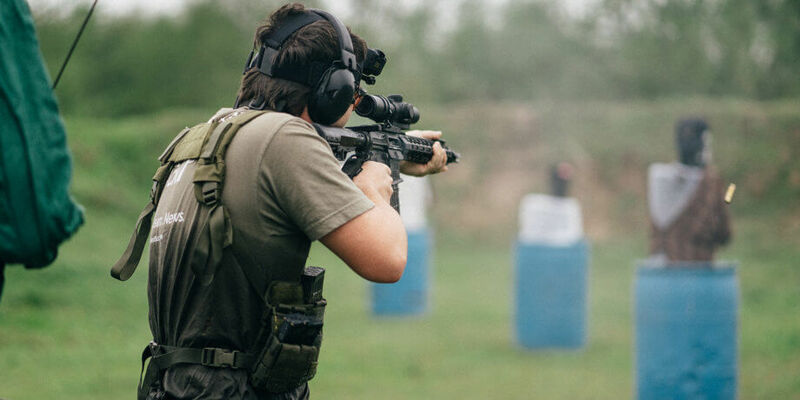 While it is possible to have a heavy AR-15, most AR-15s are quite light in comparison to many other semi-auto centerfire rifles with a similar feature set, particularly when compared to the rifles available when the AR-15 first came out. Even though the AR-15 is an inherently lightweight rifle, there are many different customizations we can perform to lighten the AR-15 beyond a standard rifle. It’s quite possible to build an AR-15 that weighs under five pounds! Now that is a lightweight rifle! Not many semi-auto centerfire rifle alternatives are capable of that. Here are some parts that will lighten an AR-15 – in no particular order. AR-15 handguards can be big, clunky, and heavy. Switching away from a Picatinny rail design to an M-Lok or KeyMod is a great way to lighten an AR-15, and even improve the ergonomics. I don’t know of anyone who likes the traditional cheese grater handguard in their bare hand. 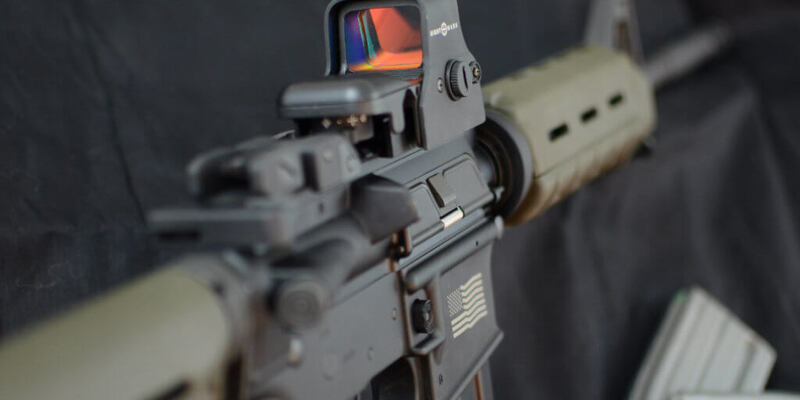 Many handguard designers have taken it a step further and created very lightweight designs that make quite a difference in not only the overall weight of the AR-15, but how the rifle actually handles. Heavy AR-15 handguards put a lot of weight out forward, hindering maneuverability and tiring shooters faster. There are some polymer handguards available for the AR-15, but they tend to not be free-float designs. Free float handguards are a useful component in having the most accurate AR-15 possible, though the difference between a free float and non-free float design is minimal when it comes to “practical accuracy.” Weigh the pros and cons for your personal rifle – is the rifle’s weight more important, or is getting that extra half MOA better accuracy more important? Long rifle barrels are great for increased velocity and heavy barrels are also handy for a variety of reasons. But both long and heavy AR-15 barrels can add a lot of weight to the rifle in addition to perceived weight as it pushes the weight out, just like the handguard. Modern barrel design can provide incredible accuracy even when the barrel heats up with a lightweight profile and/or short barrel length. Short, lightweight AR-15s provide excellent handling, making them incredibly enjoyable to shoot and are still plenty accurate for most any application except a heavy precision AR-15. The AR-15’s stock is an easy way to shave off another few ounces – no tools required! Many AR-15 stocks are needlessly heavy. Some stocks in the precision world are even intentionally heavy. While swapping the rifle stock won’t provide as much weight savings as other parts, it’s definitely easier to swap out, and oftentimes cheaper. Changing out the buttstock can change the balance of the gun, so keep that in mind. While an iron sight AR-15 will provide the lightest overall weight, optics are incredible force multipliers. With all AR-15 modification choices, we need to balance the pros and cons of the weight and benefits of the addition to the firearm. The first step in choosing a lightweight optic is to determine the primary uses of the AR-15. If you plan on having the AR-15 primarily for home defense and shooting at 100 yards an in, a good lightweight red dot is an excellent choice for an AR-15. Red dots are very easy to use, provide fast sight acquisitions, and red dots are lighter than variable magnification optics. If you plan on shooting beyond 100 yards with your AR-15, say for a competition rifle or hunting rifle, low power variable magnification optics are an excellent choice as they work as a great force multiplier. There are some excellent lightweight 1-4x or 1-6x magnified optics out there. Particularly, Leupold makes some excellent lightweight optics – an excellent choice for a lightweight AR-15 build. Polymer parts are one of the easiest ways to lighten an AR-15, or any firearm for that matter. Unfortunately, not all firearm parts can be made with a polymer. Polymer parts aren’t durable as forged or stamped metal (for now), so firearm parts that face extreme pressures or forces need to remain metal. As a general rule, polymer AR-15 lower receivers are not a good idea as the AR-15’s lower receiver was designed with the durability and strength of metal in mind. Many polymer lower receiver designs are not strong enough to withstand the rifle’s recoil. However, with some design modifications to the AR-15’s lower receiver, a polymer design can work out. Enter the GWACS CAV-15 Polymer lower receiver for the AR-15. This lower receiver design combines the stock and lower receiver into one unit and adds some material here and there for a durable and long lasting design. This is possibly one of the most effective ways to lighten an AR-15, though it is a little pricey to do. There are plenty of other great parts to lighten an AR-15, but they are shaving off just an ounce or few ounces here and there. These parts are pretty much required if you want to make the lightest AR-15 possible, but if you’re balancing cost and weight, then these parts should be passed over. This AR-15 upper receiver from Odin Works does not include a forward assist and has some lightening cuts into the upper. These lightening cuts give it a cool look and shave off a smidge of metal. Though the lack of forward assist is the primary weight saver for this AR-15 upper receiver. Bolt carrier groups, such as this FosTech Low Mass BCG provides some weight savings and can help lower the felt recoil when paired with an adjustable gas block. Using an extremely minimal foregrip such as this Troy Industries M-Lok Handstop or the Odin Works B1 Low Profile Handstop (or the KeyMod version) can save weight compared to some of the larger and clunkier vertical foregrips. Sure, it adds extra weight. But again, we must weigh the pros and cons of each element. The extra secure grip and ability to brace off of barricades can outweigh the cons of the slight extra weight. Just determine for yourself what the primary use of this lightweight AR-15 will be. There are many reasons to lighten an AR-15. The most obvious is for transportation. If you carry your AR-15 around for any extended period of time, such as a duty rifle or hunting rifle, the lighter the rifle, the less fatigue there is to deal with. As the saying goes, “ounces equal pounds and pounds equal pain” – especially after miles and miles and hours and hours of lugging around a rifle. A lighter AR-15 also aids in the maneuverability and overall handling of a rifle. If you ever have an opportunity to handle multiple ARs, try to find the heaviest and lightest. Handle them one right after the other and try swinging the muzzle around between multiple targets. It will become quickly apparent which AR-15 is handier. Another reason to lighten an AR-15 is to make it easier to use for people with smaller builds, particularly young teenagers. 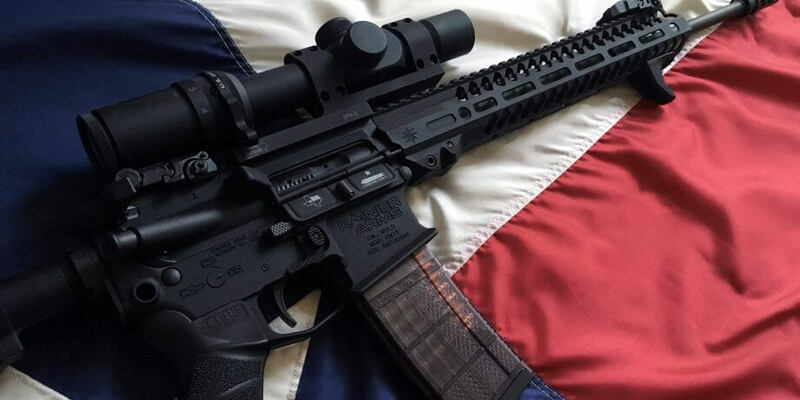 Heavy and large firearms can get unwieldy for people with lighter builds – a good lightweight AR-15 would make a difference as great as night and day for someone like that. But ultimately, it doesn’t matter how big or small you are. A lightweight AR-15 is an amazing tool to handle and fire, especially as the hours tick by during your shooting session or the miles crawl by if you’re carrying out in the world. The currently-proposed assault weapons ban includes limiting the weight of pistol configurations to 50 ounces. If passed, this will be nearly impossible to achieve – which is certain to be how they not-so-arbitrarily determined that limit. In effect, theyre planning to ban pistol configurations of ARs. The industry needs to scramble to develop lighter parts. 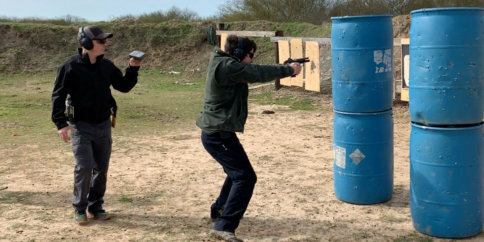 Stupid thing is the limit, if achievable, will enhance the benefits of pistol configurations, and likely their performance. Whenever anti-gunners come up with arbitrary requirements for banned firearms, the industry ALWAYS comes up with a way to work around them – especially when we’re talking about the most popular firearm in America, the AR-15.